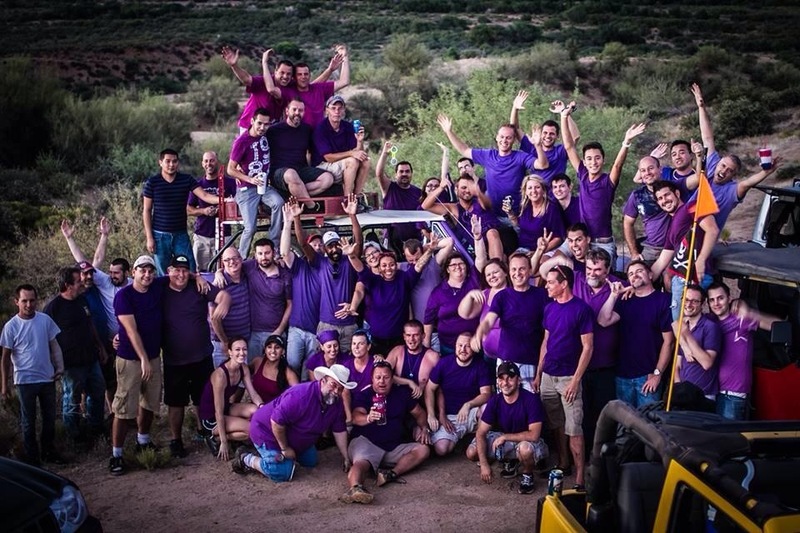 Cactus 4 Wheelers is an LGBTQ Jeep/Four Wheel Drive club. Established in Phoenix in 1997, they’ve been getting adventurous people together to enjoy the great outdoors by taking their 4 wheel drive vehicles off-road. 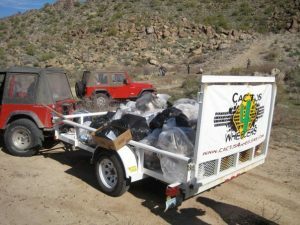 I had an opportunity to talk with Brett Wilke, founder of Cactus 4 Wheelers, and learn more about the organization. Compete: Can you tell me about the Cactus 4 Wheelers group? 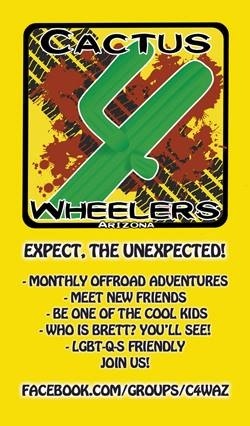 Brett Wilke: Although primarily gay in its membership, Cactus 4 Wheelers is a group of off-road enthusiasts from ALL walks of life and all sexual orientations – gay, lesbian, bisexual, transgender, closeted, questioning, straight and anything in between – we have them all. It started with some of us taking our 4-wheel drive vehicles off the paved roads and using them for what they were intended – FOUR WHEELING. After enjoying lots of great adventures together, we decided to make a name for ourselves. A few ideas came up and the final vote between our most active members sealed the name – the Cactus 4 Wheelers. As the group’s founder, I’ve worked hard with other enthusiastic members to create this very friendly and fun group of people. We love to get together, pack up and get out of the urban chaos, whether it be for just the day or a weekend overnight getaway. We also encourage non-off-road events, gatherings, camping, RVing, boating, house parties, etc. As a fun, diverse, caring and adventurous group of people, it’s a great way to spend time with old friends while making new ones, compare vehicles, give advice, learn the ropes of 4-wheeling and just have fun. What gave you the idea to start the Cactus 4 Wheelers group? I was born into an outdoor adventure family. RVing, all-terrain cycle (ATC) riding (they only had 3 wheels back then) and “Jeeping.” We are big Jeep enthusiasts in my family – my father, my brother, my aunt and uncle all have Jeeps and of course, I do, too. 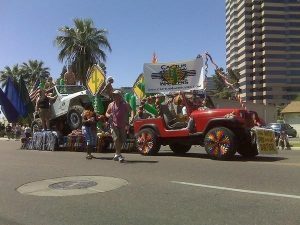 Family members have been part of a Jeep club, the Sahuaro 4×4’s, since its origination in 1973, and my uncle is a current board member. I grew up with the Sahuaro 4×4’s and it inspired me to found Cactus 4 Wheelers. We currently have 298 Facebook members and of that number I would say we have 50 – 70 active members who go out on runs together whether in small groups or large. Where do the Cactus 4 Wheelers go on their off road adventures? Our dearest, most favorite run is the Crown King trail, back away from Lake Pleasant. This trail is ever-changing in difficulty due to weather and constant travel by off-road vehicles. And the bonus at the end of this trail is the Crown King Saloon and Bear Creek Cabins for an overnight party experience. The Crown King trail is only one of many trails of all difficulty levels within the Phoenix area that can be easily accessed and enjoyed. We also have our annual Turkey Run each November. It has become quite popular – we even have members who do not own 4x4s join us for this event by driving up the maintained Bumblebee Road from I-17 to enjoy the overnight party. How often does the group meet and go on excursions? We get together at least once a month, sometimes more. We call our excursions Runs. Any other gatherings, such as camping, boating, BBQ get-togethers, group dinner outings and holiday parties we call Events. We constantly have something going on for everyone to enjoy. For more information about Cactus 4 Wheelers club check out their Facebook page at www.facebook.com/groups/c4waz/.